I must confess that this CD was a little bit of a disappointment to me. It should have been one of the highlights of my year. In theory it is, as they say, right up my street. Here was a brand new CD of music by a forgotten British composer. In fact, if I am honest he was just a name to me. I knew he had been an accomplished pianist and I was aware the he had worked at the BBC for a number of years. But that was the sum total of my knowledge. I had never consciously heard any of his music. And yet the programme promised to be excellent. 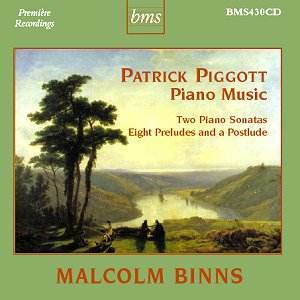 Two British Piano Sonatas with Eight Preludes as the filler. However it fell a little flat. I was trying to wonder what I expected before listening. I suppose I was imagining something quite romantic and perhaps pastoral although with a touch of spice. I deliberately did not read the cover notes before the first hearing. I did not want to prejudice myself. It was the perfect opportunity for a totally innocent ear! As I listened to the Preludes followed by the First and then the Second Sonatas I fell to thinking about Lyrita Records. Many years ago the early productions of this largely lamented record company (they still produce CDs here and there) were mainly piano works. Of course there was music by Bax and Ireland. But the names that came to my mind whilst listening to Piggott were William Wordsworth, Franz Reizenstein and Ian Whyte. Somehow, and probably unfairly, Piggott�s music brought back thoughts of these composers. Now all of these gentlemen wrote fine music. Many of these piano works were impressive, if not masterpieces. But the general memory I have of them is of certain sameness. This is what I feel about Patrick Piggott�s music. I have listened to each work twice � and have difficulty in separating out the pieces in my mind. Reading Colin Scott-Sutherland�s review and programme notes was a sine qua non before writing down my own thoughts. For one key reason � there is virtually nothing in print that is easily available about Piggott. However Scott-Sutherland has written a long essay for the British Music Society, British Music Volume 23 (2001) � a list of compositions by Piggott is also included. Scott-Sutherland makes an interesting statement that has coloured my thoughts about these compositions. He states that Piggott "significantly ... studied composition with Benjamin Dale, which was to have a considerable influence on his later work." But later he goes on to say that [Piggott] might have been expected therefore to take his place in British music with Rawsthorne, Berkeley and Tippett. But the influence of Dale (my italics) ... continued throughout his life." Somehow the implication is that poor old Benjamin Dale was responsible for Piggott�s lack of lasting success and current notice. The darker side of Piggott�s art is displayed especially in the Postlude of the Third Set of Preludes. [Track 9: 00:00 � 00:50] Yet even here the romantic influence of Dale is, I think, just perceptible. Let us consider the �Dale effect� for a moment. Dale�s magnum opus is the Piano Sonata in D minor. It was composed over a three year stretch from 1902 to 1905. It was influential on the then young York Bowen and the pianist Myra Hess. There is no doubt that Benjamin Dale was fully acquainted with the pianism of the late nineteenth century. It was certainly not pastiche but did nod in many directions including Schumann, Liszt and Brahms. The influence of Balakirev�s Islamey is also prominent. Other reviewers have detected hints of Rachmaninov and even the Warsaw Concerto by Richard Addinsell. All in all quite an eclectic work. But it was the inherent romanticism that carried it. It remains one of my favourite works for piano from the British School. It is this inherent romanticism that informs some of Piggott�s music with an emotional as opposed to a generally intellectual quality. In spite of my reservations about Piggott�s music, there is no doubt that there are many attractive moments in these pages. There is a considerable degree of virtuosity required to play all these pieces. I accept that often there is a balance between the more lyrical moments and the restless passages. But it is the restless passages that seem to me to be the �weakest link�. Scott-Sutherland has pointed out that Piggott loved to use �patterns� in the constructions of music. And so, of course, have many other composers. But I cannot help feeling that by using the patterns he is note-spinning. However, when push comes to shove, this CD is required listening for all enthusiasts of British Piano music. And that is in spite of much that I have said above. It seems to me that this is music that is very slow to reveal its charms. I have listened to the Second Sonata for a third time [more than I would normally for any �new� piece of music] and am just beginning to get to like it � the rambling notwithstanding. Yet I believe that few people will be prepared to invest this amount of time in picking over a relatively obscure Sonata. I noted above that Piggott is likened to the generation of composers including Britten, Rawsthorne, Berkeley and Tippett. To my ear at least, he lacks the genius of Britten, the ability to balance various styles that Rawsthorne excels at and finally he lacks the sense of humour and subtlety of Berkeley. And from the post-romantic perspective he does not have the poetry and depth of Ireland and Bax. The fine programme notes are by Colin Scott-Sutherland and are effectively an essay on Piggott�s performances rather than just notes. Although, I do wonder about the �greeny� colour of the CD cover. It makes me feel a little sea-sick!